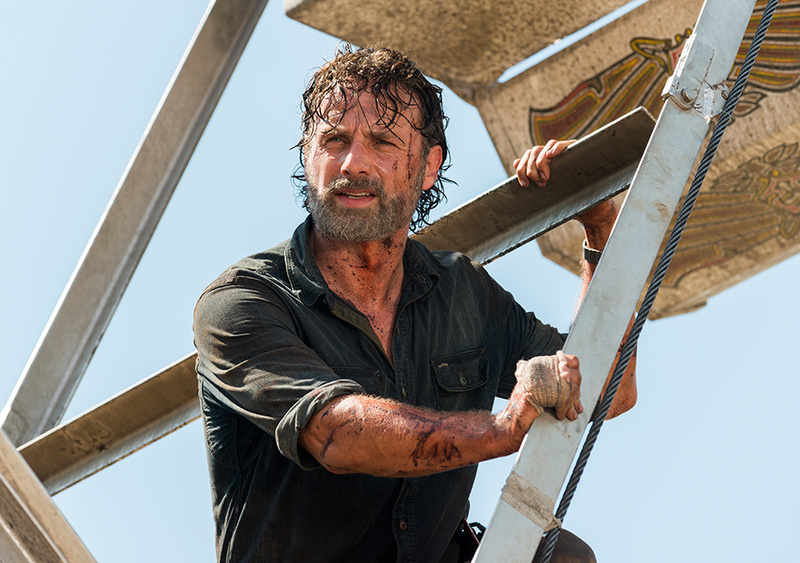 This week’s episode of The Walking Dead is so good that I almost don’t want to point out the flaws. However, I do need to provide a full critique, so just note how irritating it is to find the show reducing Rosita to one mode and finding a minor flaw in the Rick/Michonne story that was otherwise stellar. Minus these little things though, “Say Yes” is structured in such a fun and loose way that you forget this has largely been a show about people dealing with horrible lives and many terrible people around them. “Say Yes” is happy to set the tone right away, as we watch a montage of Rick and Michonne on their gun hunt. This leads to lots of zombie killin’ and romance, which is handled in a far more lighthearted way than previous mission-based episodes. It works because two of the series mainstays work well together and bringing them together romantically was a very smart move on the part of the show. 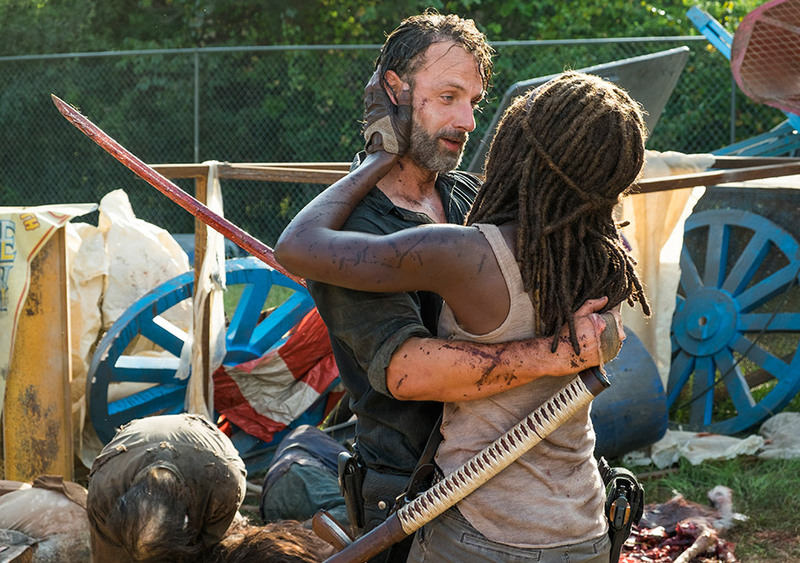 Both Andrew Lincoln and Danai Gurira find what works about their characters together and make the acting sing. We often get these character-focused episodes, with only a minor B-plot to also contend with and that structure is well-used here. Given the focus on the characters directly involved in the search for guns, this show has not lost track of the current situation, but it also found a way to provide some breathing room. Things actually do happen this week, but there is a looseness that means audiences could actually have some fun on this mission. I’m sure some may miss the harder edge this group constantly struggles with, but is there really much to complain about when the fun being provided allows for a darkly humorous amount of zombie killing? Look at the centerpiece of “Say Yes”, in which Rick and Michone (I’d call them “The Mick”, but Fox has a TV show that makes the nickname too confusing) stumble upon a fair. Here’s a unique location that is also exactly what the two are looking for, as many zombified soldiers are still equipped. It has Rick and Michonne having fun forming a plan, racking up a zombie kill count and being all-around bad asses. It also leads to a silly moment of drama, but we’ll get to that. Point being, this feels like The Walking Dead has found a way to take a break from the norm, but still deliver on what people like about this show. As far as that silly moment, well Rick almost dies because of a deer. There is symbolic meaning to take from it, as being a survivor in this apocalypse means appreciating any moment of beauty one can find, but it also leads to a cheap move. Fortunately this show didn’t pull a fast one and allow for a cliffhanger ending, because no one’s really going to believe Rick died, but plenty of time was spent stringing out the reveal of his survival. However, there’s a minor issue to take. I can get that Michonne has a connection with Rick that is special, but we also know how strong of a character she is. While the concept of giving up if your loved one is no longer around is easy to understand, it feels like diminishing Michonne’s character a bit if we are to believe she would be lost without this man in her life. Fortunately the episode makes such a good case for these two crazy kids being together that I could buy into what it was going for, but it still felt a little false, all things considered. Less enjoyable is watching Rosita pout and complain. This is what the show has done with her for weeks now and it has only yielded diminishing returns. At least the end of this episode supplies her with purpose, as a team up with Sasha now has potential for a wild suicide mission, but it hasn’t helped the character in the build-up. It’s just been one mood magnified over and over so all we see is the same anger with no new shading. At least Tara’s crisis has been more intriguing to watch. Following her encounter with the Oceansiders in the first half of the season, it has come down to whether or not she informs Rick about the potential for gathering more weapons. While I have no real idea what it’s going to be like now that she’s spilled the beans, the lead up to this confession allowed for some interesting moments and time with Judith (who has grown up a bit). Given the negotiation style of Jadis, leader of Bartertown the Scavengers, I don’t expect this news to be another easy win for Rick’s developing army. Given how that last paragraph was all about the plot, it is nice to think back on the rest of what I’ve written and take joy in watching The Walking Dead take a second to collect itself. Rather than show us more of how terrible Negan’s rule is and all that comes with that, we watched two lovebirds kill a bunch of zombies and joke with each other about how awesome they are at killing bunches of zombies. The fact that it came off as authentic is what matters most, which is why this pairing has yielded fine results. 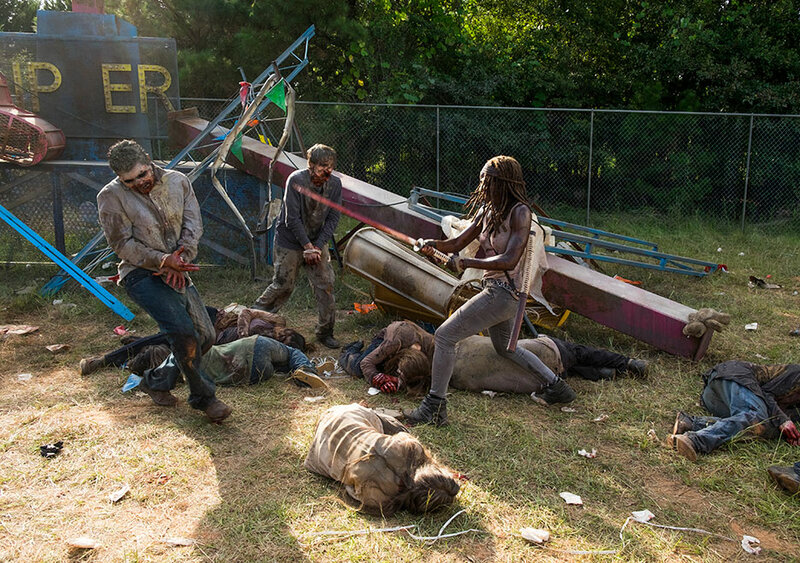 It will be nice to spend time with some of the other characters again, but there were plenty of good times to be had with Rick and Michonne winning more than just tickets at the fair. 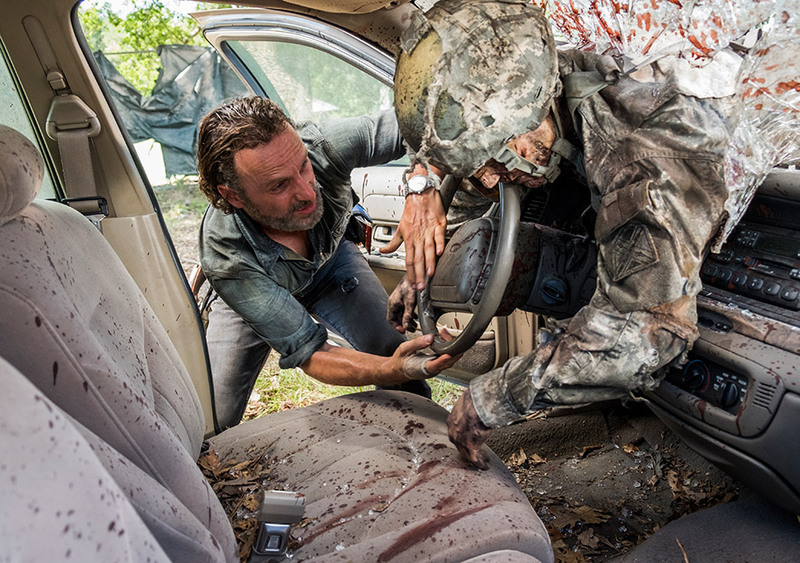 Zombie Kill of the Week: Lots of great moments, but I did enjoy the effort Rick had to put into removing a walker from a windshield, piece by piece. Some Saviors were found golfing. Rick and Michonne took their stuff, but did they kill them too? So someone just left a fake gun to trick Rosita? Even Gabriel had a good moment in the form of a decent one-on-one sermon. Bear McCreary managed to throw in some twisted carnival music in his score this week. Nice touch. That Deer was not the best CG creation, but I’ll allow it. Following the silly moment of Rick’s not-death, he did give a good speech about how he doesn’t sleep. Jadis wanted the cat back, which I found to be hilarious. Don’t take their stuff Rick! I’m going to start questioning the amount of travel and the time to do so. People were all over the place this week.